Notwithstanding plastic surgery, health improvements and other modern biological enhancements, we are all getting older, and the country is too. Today roughly 18.5% of the U.S. population is over 60, compared to 16.3% a decade ago; by 2020 that percentage is expected to rise to 22.2%, and by 2050 to a full 25%. Yet the graying of America is not uniform across the country — some places are considerably older than others. The oldest metropolitan areas, according to an analysis of the 2010 census by demographer Wendell Cox, have twice as high a concentration of residents over the age of 60 as the youngest. In these areas, it’s already 2020, and some may get to 2050 aging levels decades early. For the most part, the oldest metropolitan areas — with the exception of longtime Florida retirement havens Tampa-St. Petersburg and Miami — tend to be clustered in the old industrial regions of the country. These are regions that have suffered mightily from deindustrialization and the movement of people toward the South and West. These metro areas now make up eight of the 10 oldest among the nation’s 51 largest metropolitan statistical areas. The oldest city in America is Pittsburgh, where 23.6% of the metro area’s population is over 60 (see the full list in the table below). The old steel capital is followed by such former robust manufacturing hubs as Buffalo (No. 3 on our list), Cleveland (fifth), and Detroit (ninth). How did these places get so old? The biggest factor: migration deficits. More Americans have been leaving these cities than moving there, and people who move tend to be younger. Meanwhile these graying cities attract relatively few immigrants from abroad. Pittsburgh, for example, ranks 34th among the 51 biggest metro areas in net domestic migration, losing some 2% of its population to other places over the past decade. It also stands 50th in foreign immigration over the same period. Buffalo has fared even worse: it’s 40th in domestic migration and 49th in new foreign-born residents. Another factor is low birth rates. An aging population, not surprisingly, does not produce many children. In 2000 only three U.S. metro areas had more elderly than children under the age of 15 (Pittsburgh, Miami and Tampa-St. Petersburg, Fla.). The 2010 Census showed we now have 10, with the addition of Buffalo, Boston, Cleveland, Hartford, Providence, Rochester and San Francisco to the first three. Thus the elderly population is overtaking the younger population not only in Florida’s retirement havens, but in a number of Rust Belt and Northeastern cities — and the West Coast may not be far behind. The graying trend, like aging itself, is pervasive. The number of children relative to elderly declined over the past decade in every one of the 51 largest major metropolitan areas. But not all of America’s most rapidly aging cities are in Florida and the Rust Belt. Even the New York metro area, usually associated with the “young and restless,” is also getting senescent, with an elderly population nearly equal to that of the young. It ranks 15th on our list of the grayest cities. This is surprising, since like more-old-than-young San Francisco (17th place), immigration from abroad has been strong. Other metropolitan areas widely celebrated as magnets for the young and hip are also aging rapidly. For example, while Portland remains younger than average, it rose from 36th oldest in 2000 to 29th oldest in 2010. Even Seattle got older, rising from 39th place in 2000 to 34th in 2010. This pattern is surprisingly prevalent even in the urban cores that are at the heart of these regions. In New York County, better known as Manhattan, roughly 19% of the population is over 60, well above the national average. In San Francisco the percentage of elderly is a tad higher at 19.2%. These choice places are expensive to move into, so getting there some decades ago is a big plus. As the entrenched populations age, these places may become far more geriatric than commonly assumed. But it’s not just the core cities that are getting older. In fact, in terms of rate of aging, some of the places going gray the fastest include suburbs of these cities that used to be the primary destinations of young families. Among the most rapidly aging places within the country’s largest metro areas are New York City’s bedroom communities of Nassau County, N.Y., and Bergen County, N.J.; Middlesex outside of Boston; and suburban St. Louis County. What does this mean to employers, investors, and, most importantly, residents of these regions? In some cases there are positives in the near-term economic picture. Some aging metro areas like Pittsburgh and Boston have done relatively well over the course of the recent long recession. This may be in part because older homeowners were less impacted by the housing bubble than younger ones, who tend to cluster in Sun Belt cities such as Atlanta. In some cases, inertia from a large employed base of older skilled workers may have also insulated local economies. Older workers have tended to weather the recession better than younger ones and a surprising number have managed to stay in the workforce. Indeed, senior employment has jumped 27% in the last five years while that of younger and middle aged workers has fallen notably. Seniors may also become something of an entrepreneurial engine for local economies, notes one recent Kauffman Foundation Study. In fact, the share of new entrepreneurs who are 55 to 64 year old has risen from 14.3% in 1996 to 20.9% in 2011. Yet there are also long-term problems implicit in too rapid graying, chiefly in the prospect of a deficient future workforce. In Massachusetts, known among some demographers as “the granny state,” the population under 18 fell 5% over the past decade and there was a slightly larger drop in the 18 to 44 demographic. As the population of those 45 and older grows, there may not be sufficient new income to cover the rising costs for elder care. More troublesome may be the labor force impacts of rapid aging, as there is a shortage of some skilled workers, both in the Rust Belt and tech centers, particularly younger ones. This reality is already causing problems in Europe, particularly in the economically devastated south, and also more prosperous East Asia, particularly Japan. An older population, and fewer families, tend to depress economic growth, consumer demand and entrepreneurial creativity. Japan today is not only much older, but also more financially hard-pressed than in its ’80s heyday, heavily in debt and losing its once dominant position in several critical industries. It is conceivable that some now rapidly aging metropolitan areas will be able to shrug off these effects, by attracting immigrants and newcomers from other parts of the country. But to do so, they will have to become more attractive to families, by creating more affordable, lower density housing and growing the local economy. This, however, may prove difficult to achieve, especially in cities that seeking to severely limit or even outlaw “family friendly” detached housing (such as in California and the Northwest). Economic growth could also be hampered as the electorate ages and political pressure builds to increase support for the elderly (a dynamic already evident in Europe and Japan), even at the expense of future generations. 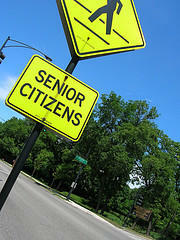 "Senior Citizens Crossing" photo by Flickr user auntjojo.